As we generally knows these four ways to make money from domain name. But there are huge number of people who are making lot of money with the third think trick. They are getting lot of benefit from it without parking ,without developing a domain name. 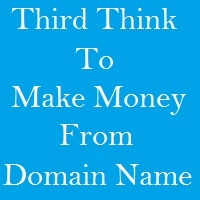 If you do not want to park your domain names and do not want to develop your domain name then there is third trick available for you to make money online easily. Yes know your domain name better what is the potential of domain name what is thing that comes in our mind when we think about the domain name. Then obviously thing which comes in our mind is that this domain name can be domain industry related. So you can sell domain names by using this domain name. Now you just need to do one thing is that you need to do domain forwarding and forward it with masking to a affiliate link which provides 99 cents domain names specially to attract the people. This is called the domain name affiliate earning. (2) Get your affiliate link that is relevant niche of your domain name. (3) Now Login to your domain name registrar account. (4) Go to settings and redirect Domain URL Option. (5) Now redirect or forward your domain name to your affiliate link. (6) Do the Forwards with masking option so that your site name would show in your affiliate link. Now when a visitor come to your domain name then he or she will be redirected to your affiliate link URL where he can have the page showing to register for 99 Cent Domain name. Then if he will purchase then you will get the commission for that. (1) You should do forward with masking so that visitor can see your domain name is there. (2) If your domain name is related to domain name industry then you should redirect it to specially for 99 Cents domain name. Because today everyone want to purchase domain name at 99 cent. This was all about the make money from Domain Name Affiliate.